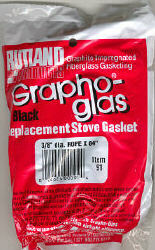 Black graphite impregnated material for replacing wornout gaskets on "airtight" stoves and furnaces. Rutland's ropes and tapes are manufactured from textured fiberglass for high temperature sealing qualities. Black graphite impregnated fiberglass looks better while resisting sticking and creosote build-up. They are both soft and flexible and can be used in almost any gasket application. Special manufacturing makes them easy to handle in applications where they are cut or fabricated. Seal lasts longer and efficiency is increased. Inspect and replace worn gasketing on woodstove doors, furnace doors, oven doors, boiler doors, and dust collectors routinely for peak operating efficiency.Used as original equipment by stove manufacturers worldwide. Greater abrasion resistance than untreated fiberglass gasketing.